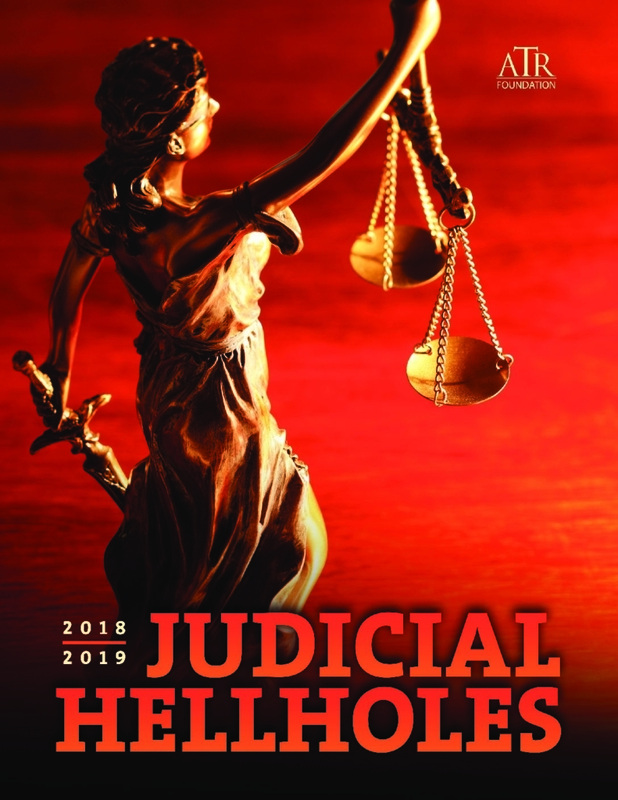 Dec. 4, 2018 (WASHINGTON) – Today, the American Tort Reform Foundation released its 2018-2019 Judicial Hellholes report. California tops the list, with Florida, New York City and St. Louis not far behind. California, a perennial Judicial Hellhole, has the unfortunate distinction of once again earning this year’s No. 1 ranking. It was last at No. 1 in the 2015-2016 report, and also held the No. 1 title in the 2013-2014 and 2012-2013 reports. “California judges and legislators expand liability at almost every given opportunity,” Joyce said. “This year, the court adopted ‘innovator liability,’ a novel and expansive theory concocted by the trial bar that has been rejected by more than 35 state and federal courts around the country. It holds brand-name drug manufacturers responsible for injuries caused by a generic drug, and serves only to disrupt innovation and hamper investment,” Joyce said. This year’s No. 2 Judicial Hellhole is Florida, where the state’s Supreme Court issued a series of liability-expanding opinions that invalidated civil justice reforms including rejection of the Daubert standard for expert witness testimony – a standard adopted by more than 30 state and federal courts. Coming in at No. 3 is New York City which is no stranger to the Judicial Hellholes report as its asbestos court was on the list from 2013 to 2017, but this year the distinction expands to include other types of litigation in the city. No. 4 on the list is the City of St. Louis. Louisiana’s multitude of lawsuits and Governor John Bel Edwards’ hiring of private attorneys land the state in the No. 5 spot this year. This year’s No. 6 Judicial Hellholes ranking goes to the Philadelphia Court of Common Pleas, due in part to the excessive pharmaceutical litigation pending in the court. 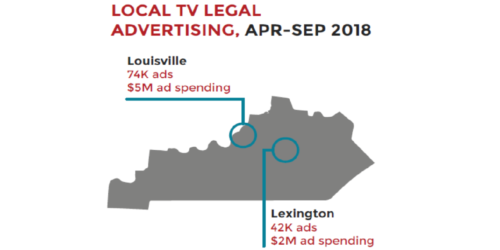 Not only was there a sizeable increase in the number of cases filed in the court’s Complex Litigation Center, but 84 percent of the cases were filed by out-of-state plaintiffs. Coming in at No. 7 this year is the New Jersey state legislature that, with the exit of business-friendly Governor Chris Christie, pursued a liability-expanding agenda with high hopes that new Governor Phil Murphy would be sympathetic to the cause. “While the Judicial Hellholes report typically focuses on courts, the New Jersey legislature is an exception, as it distinguished itself as the most plaintiff-friendly legislature in the country,” Joyce said. However, the New Jersey Supreme Court made progress in its efforts to become a more judicially fair state, as shown by its enactment of the Daubert standard with regard to expert evidence. St. Clair and Madison Counties in Illinois earn the No. 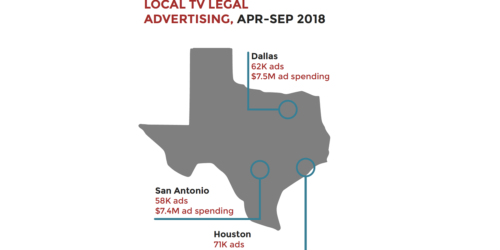 8 spot due to the increase in “no-injury” consumer class action lawsuits filed in the counties. Many of these cases target food manufacturers for their labeling, claiming that products like cake mix or barbecue are not actually “all natural” as they might be labeled. The counties also remain among the plaintiffs’ bar’s favorite jurisdictions for asbestos lawsuits, and the Illinois legislature continues to turn a blind eye to the abuses. Rounding out the list at No. 9 are Minnesota’s Twin Cities. This year’s “Watch List” puts several state supreme courts on notice, including Colorado, Georgia, Montana, Pennsylvania and West Virginia, along with the city of Newport News, Va. and the Ohio 8th District Court of Appeals in Cuyahoga County. Not all developments are bad, however. There are a few “Points of Light” including a favorable ruling from the U.S. Supreme Court regarding class action waivers in arbitration agreements, the 5th Circuit Court of Appeals decision to overturn a half-billion dollar verdict against Johnson & Johnson, the New Jersey Supreme Court’s series of well-balanced decisions, and the Wisconsin Supreme Court’s upholding of the limit on noneconomic damages in medical liability cases. Additionally, eight state legislatures enacted nine civil justice reform statutes in 2018 as well. “Finally, this year’s three ‘Closer Looks’ examine junk science in the courts, the influx of “no-injury” lawsuits, and the attempt by activist state attorneys general to regulate through litigation. A recent study released by the U.S. Chamber Institute for Legal Reform highlights both the overall cost and inefficiencies of the tort system. The report states that the cost and compensation paid in the U.S. tort system totaled $429 billion in 2016, accounting for 2.3 percent of the U.S. gross domestic product. 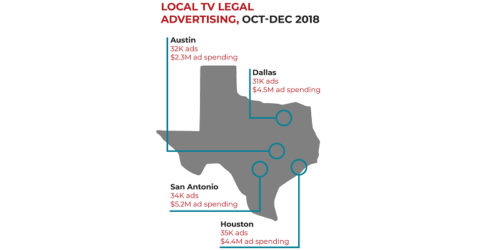 The 2018-2019 Judicial Hellholes jurisdictions largely contributed to these costs, and on a local level, they saw job loss, personal income loss, and state revenue loss due to the excessive tort costs in the states. The data strongly demonstrate the need for a more balanced civil justice system. #3 NEW YORK CITY While the New York City Asbestos Litigation has been featured in the report since 2013, the 2018-2019 report broadens the “Judicial Hellhole” distinction to include other types of litigation in New York City. New York City courts are filled with frivolous consumer class actions and judges permit plaintiff-friendly procedures and high awards in asbestos courts. The state high court also further stacked the deck against defendants in personal injury litigation. Hedge funds are increasingly investing in New York litigation and driving some of the most expensive cases in the state. Additionally, the legislature failed to address excessive construction liability and asbestos litigation abuse, and it expanded medical liability. #7 NEW JERSEY LEGISLATURE In 2018, the New Jersey legislature distinguished itself as the most plaintiff-friendly legislature in the country. While the Judicial Hellholes report typically focuses on the courts, the New Jersey legislature is an exception because of its drastic liability-expanding agenda for the 2018-2019 session. The trial bar also has gained significant power and influence in the state legislature, leading to legislators’ refusal to entertain even the most modest of tort reforms. #9 TWIN CITIES, MINNESOTA A newcomer to the Judicial Hellholes report, the Twin Cities’ position was solidified after the attorney general mishandled a lawsuit against a large Twin Cities employer and a Hennepin County trial judge stripped a company’s defenses during the course of a trial. The lower courts appear to be following the lead of the state’s high court after it subjected property owners to expanded liability in 2018. 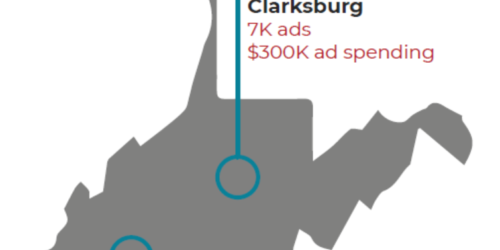 Beyond the Judicial Hellholes, this report calls attention to seven additional jurisdictions that bear watching due to their histories of abusive litigation or troubling developments. Watch List jurisdictions fall on the cusp – they may drop into the Hellholes abyss or rise to the promise of Equal Justice Under Law. NEWPORT NEWS, VIRGINIA Perhaps most notable in 2018 is the lack of cases to go to trial in Newport News. Plaintiffs and defendants alike have sought to litigate asbestos cases in federal court, and, as a result, it is hard to know whether problems and inequities that have manifested themselves in the past will persist. Newport News has been known for its evidentiary double standards, unsound legal rulings and lack of transparency in asbestos litigation. OHIO EIGHTH DISTRICT COURT OF APPEALS- CUYAHOGA COUNTY A newcomer to the Watch List, the district has developed a reputation for handing down large damage awards and being a “haven” for class action lawsuits. It has developed a troublesome pattern of issuing unbalanced plaintiff-friendly decisions, which had to be overturned multiple times by the Ohio Supreme Court. PENNSYLVANIA SUPREME COURT The high court issued a series of liability expanding decisions and has been selective, at best, in following U.S. Supreme Court precedent, leading the state’s courts to cater to out-of-state plaintiffs and their lawyers. SUPREME COURT OF APPEALS OF WEST VIRGINIA In an unprecedented move, West Virginia lawmakers voted to recommend the impeachment of all sitting members of the state’s highest court in 2018. Prior to the impeachment chaos, the court also issued a disappointing class certification decision that rejects U.S. Supreme Court precedent and encourages plaintiffs’ lawyers from all over the country to flock to West Virginia courts to file class action lawsuits. The 2018 elections did bring about some encouraging news with the election of U.S Representative Evan Jenkins and former House of Delegates Speaker Tim Armstead to fill the vacancies on the court.